According to WHO reports, in India there are around 100 million disabled people and another 100 million are people with special needs including senior citizens and people with severe health disorders. Surprising? India doesn’t have any dedicated platform which can provide information about special products, services and places with easy accessibility for such people. Globally in many developed nations, the situation is different, with many apps and platforms available to these special people. The team from Billion Ables was able to identify this gap and decided to focus on this niche area. The company Billion Ables Services Pvt. Ltd. was incorporated in September 2015, with a mission to increase accessibility, inclusion and empower people with special needs. 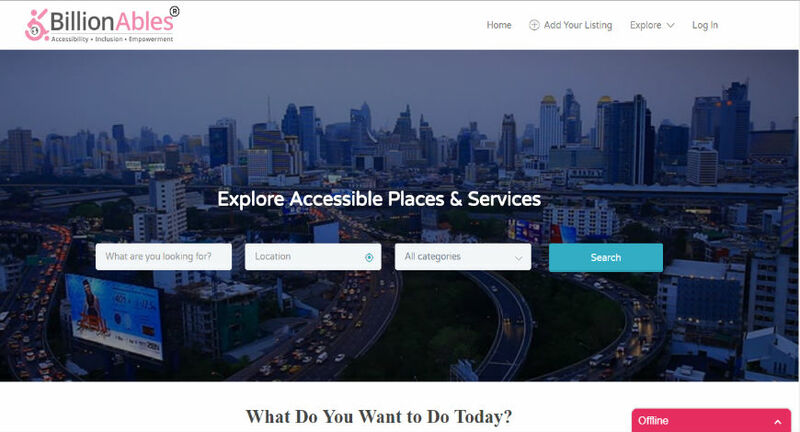 Billion Ables is the first Indian crowd sourced inclusive online platform which is committed to introducing and empowering people with special needs to a more accessible world by providing information on accessible places, products and services exclusive for them. With an already operational website www.billionables.com, the next logical step was to offer greater flexibility is to offer a mobile app. The app will be launched in collaboration with the United Nations Information Council for India and Bhutan at their Lodhi Road office in May 2017 to coincide with Global Accessibility Awareness Day. The mobile app will present a search engine platform containing relevant listings for the special needs community. It will offer greater flexibility and value add on with an in-app booking feature for ease of access for end users making it an online database and marketplace simultaneously. The company is the brain child of Sameer Garg disabled due to a spinal injury two decades ago and Deepak Kumar, the technical wizard of the company. The website currently has 350 listings across various categories across India. More than 2000 users are actively using the platform and the number grows each day. The website is has a strong presence in Delhi, Rajasthan and Goa with verified listings added to daily. Billion Ables Services Pvt. Ltd. recently raised an undisclosed seed round through international institutional investors led by Pankaj Gupta (this is his own personal funding), co-CEO of the Gulf Islamic Investments, a UAE-based financial services company regulated by the Emirates Securities and Commodities Authority (ESCA). The Gulf Islamic Investments enjoys a track record of managing 2.5 billion dollars in assets and has secured 5.5 billion dollars in debt and has in excess of 1.0 billion dollars as equity. Pankaj Gupta, co-CEO of Gulf Islamic Investments said, “Empowerment and equal accessibility is a must for the ever growing disabled and persons with special needs community in India, which Billion Ables is tackling with an effective and dynamic combination of both technology and crowd sourcing. The launch of its "BillionAbles" platform not only presents on hand and up to date information on relevant places and products for users but also provides tremendous value add as it establishes an integrated platform for a plethora of organisations and firms to reach out to this untapped user base, of approximately 40-50 million, further enriching the development of this community”.